University of Health Sciences (UHS) has announced answer keys for MDCAT re-test held on 29th October 2017. Students can match their answers with the given keys to calculate marks in UHS MDCAT re-test. Answer key for MBBS and BDS admission is published by UHS. There are 20 Public sector medical colleges of Punjab, and almost 3400 seats available for which students can apply on the basis of MDCAT test. Pakprep.com is the best source for the preparation of MDCAT/MCAT test preparation our MCQ’s data bank contains more than 15,000+ fully explained MCQ’s with answers and solutions which help students to get good score in MDCAT/MCAT test. To start your preparation today Click Here. Here is the details list of Answer Keys. This entry was posted in MDCAT, Punjab UHS MCAT, UHS MCAT and tagged Best way to prepare for UHS MCAT, Changes in UHS MCAT Syllabus, chemistry mcat, chemistry mdcat, Dental Entry Test UHS, Dow University of Health Sciences (DUHS), download UHS MCAT Papers, download UHS MDCAT Papers, Download UHS Past Papers, How to Prepare for UHS MCAT?, MCAT, MCAT answer key, MCAT answer key 2017, MCAT answer keys, MCAT answer keys 2017, MCAT English syllabus, MCAT entry test, mcat format, mcat mcqs, MCAT Merit list, mcat result, mcat score, MCAT test, MCAT test answer key, MCAT test answer key 2017, MCAT test answer keys, MCAT test answer keys 2017, MDCAT, MDCAT 2017, MDCAT answer Key, MDCAT answer Key 2017, MDCAT answer Keys, MDCAT answer Keys 2017, MDCAT Biology, MDCAT Biology explained MCQs, MDCAT Biology MCQs, MDCAT Chemistry, MDCAT Chemistry explained MCQs, MDCAT Chemistry MCQs, MDCAT English explained MCQs, MDCAT English MCQs, MDCAT English syllabus, MDCAT entry test, MDCAT explained MCQs, MDCAT Merit list, MDCAT New Syllabus, MDCAT online MCQS, mdcat result, mdcat score, MDCAT solved MCQs, MDCAT solved papers, MDCAT test answer Key, MDCAT test answer Keys, MDCAT test answer Keys 2017, New UHS MCAT Syllabus, Past Papers UHS MCAT, Past Papers UHS MDCAT, Preparation of Document for UHS MCAT, punjab mcat, Punjab MCAT 2015 Online Preparation, Punjab MCAT Biology MCQs, Punjab Mcat format, punjab mcat mcqs, punjab mcat merit list, Punjab MCAT Past Papers, Punjab Mcat result, PUNJAB MCAT Score, Punjab MCAT Solved Papers, Punjab MDCAT Biology MCQs, Punjab MDCAT Chemistry MCQs, Punjab MDCAT English MCQs, Punjab MDCAT Physics MCQs, Punjab Medical Admission UHS, Punjab UHS MCAT, Punjab UHS MCAT Syllabus, punjabmcat, Sample UHS MCAT MCQs, Solved UHS MCAT past papers, UHS, UHS Admission, UHS Admissions, uhs answer key, uhs answer key 2017, uhs answer keys, UHS Biology MCQs, UHS Chemistry MCQs, UHS Chemistry New Syllabus, UHS Chemistry Syllabus, UHS Entry Test, UHS Fee, UHS MCAT, UHS MCAT 2013, UHS MCAT 2014, UHS MCAT 2017, UHS MCAT Aggregate Score, UHS MCAT Biology MCQs, UHS MCAT Chemistry MCQs, UHS MCAT Dates, UHS MCAT Documents, UHS MCAT English MCQs, UHS MCAT MCQs, UHS mcat merit list, UHS MCAT Online Preparation, UHS MCAT Past Papers, UHS MCAT result, UHS MDCAT, UHS MDCAT 2017, UHS Physics MCQs, UHS result, UHS test answer key, UHS test answer key 2017, UHS test answer keys, UHS test answer keys 2017, UHS Test format, UHS test result on November 1, 2017 by Pakprep.com Admin. Important announcement for students appeared in MDCAT test on 27th August 2017. Lahore High Court announced that University of Health Science (UHS) will cancel the old MDCAT test held on 27Th August and will retake test for Public sector Medical colleges of Punjab. UHS will announce new dates for Punjab MDCAT/MCAT test for 2017. New admission policy and dates will be announced soon. 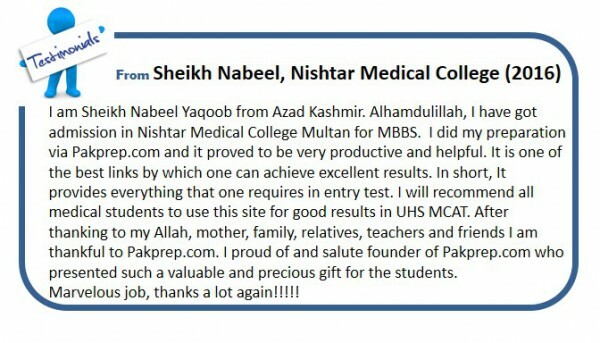 www.pakprep.com provide complete preparation for Medical Colleges Entry Test. 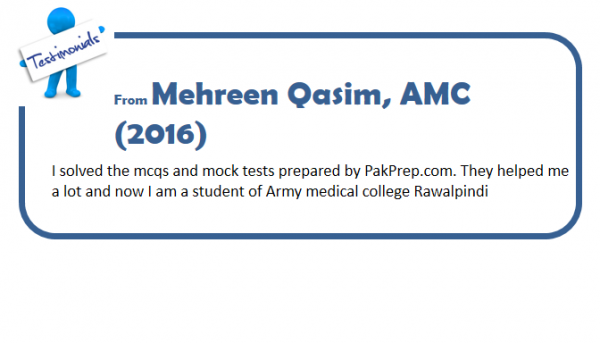 www.pakprep.com have more than 15,000+ fully explained MCQ’s with answers and explanation which help students in getting good marks in Medical college entry test. Here is the notification from UHS. This entry was posted in MDCAT, Punjab UHS MCAT, UHS MCAT and tagged Balochistan MCAT MCQs, Best way to prepare for UHS MCAT, Changes in UHS MCAT Syllabus, chemistry mcat, chemistry mdcat, download UHS MCAT Papers, download UHS MDCAT Papers, etea mcat, How many MCQs in Sindh MCAT, How to Prepare for Punjab MCAT, How to Prepare for Punjab MDCAT, How to Prepare for UHS MCAT?, how to prepare mdcat, Important Biology Topics Punjab MCAT, Important Biology Topics Punjab MDCAT, Important Chemistry Topics Punjab MCAT, Important Chemistry Topics Punjab MDCAT, Important Chemistry Topics UHS MCAT, Important English Topics Punjab MDCAT, important mdcat topics, Important Physics Topics Punjab MDCAT, Important Punjab Mcat topics, MCAT, MCAT English syllabus, MCAT English syllabus 2017, MCAT entry test, mcat format, mcat mcqs, MCAT Merit list, MCAT New Syllabus, MCAT registration, MCAT registration date, MCAT registration dates, mcat result, MCAT Syllabus 2017, MCAT test, MDCAT, MDCAT 2017, MDCAT Biology, MDCAT Biology explained MCQs, MDCAT Biology MCQs, MDCAT Chemistry, MDCAT Chemistry explained MCQs, MDCAT Chemistry MCQs, MDCAT English explained MCQs, MDCAT English MCQs, MDCAT English syllabus, MDCAT entry test, MDCAT Merit list, MDCAT online MCQS, MDCAT Physics explained MCQs, MDCAT registration dates, mdcat result, MDCAT solved MCQs, MDCAT solved papers, MDCAT syllabus, MDCAT syllabus 2017, New UHS MCAT Syllabus, Past Papers UHS MCAT, Physics MCQs Sindh MCAT, punjab mcat, Punjab MCAT 2017 Syllabus, Punjab MCAT Biology MCQs, Punjab MCAT Chemistry MCQs, Punjab MCAT English MCQs, Punjab Mcat format, Punjab MCAT New Syllabus, Punjab MCAT Syllabus 2017, Punjab UHS MCAT, punjabmcat, Solved Punjab MCAT MCQs, UHS, UHS Admission, UHS Admissions, UHS Biology MCQs, UHS Chemistry MCQs, UHS Chemistry New Syllabus, UHS Entry Test, UHS MCAT, UHS MCAT 2017, UHS MCAT Dates, UHS MCAT result, UHS MCQs, UHS MDCAT, UHS MDCAT Aggregate Score, UHS MDCAT English MCQs, UHS MDCAT Entrance Test, UHS test result on October 6, 2017 by Pakprep.com Admin. University of Health Sciences (UHS) is the main body which organize entry test for Public sector medical colleges of Punjab every year. This test is known as Medical and Dental College Admission Test (MDCAT/MCAT). MDCAT test will consist of MCQ’s type question from Biology (88), Chemistry (58), Physics (44) and English MCQ’s (30). Expected registration dates of MDCAT test are starting from 10th July 2017 and last date of Registration will be 28th July after that no application will be entertained. Test for MDCAT/MCAT will held on Sunday 20th August 2017. There are very limited seats in MDCAT/MCAT test so only those students can get admission in desired Medical colleges who will perform well in entry test. Pakprep.com provide vast range of MCQs according to MDCAT/MCAT new syllabus announced by UHS in 2017. www.pakprep.com offer more than 15000+ fully explained MCQS with complete explanation which help students to get good marks in MDCAT/MCAT test. To start your preparation for MDCAT Click here. This entry was posted in MDCAT, Punjab UHS MCAT and tagged Best way to prepare for UHS MCAT, Changes in UHS MCAT Syllabus, chemistry mdcat, download UHS MCAT Papers, download UHS MDCAT Papers, How to Prepare for Punjab MCAT, How to Prepare for Punjab MDCAT, How to Prepare for UHS MCAT?, how to prepare mcat, how to prepare mdcat, How to prepare PUNJAB UHS Mcat, Important Biology Topics Punjab MCAT, Important Biology Topics Punjab MDCAT, Important Chemistry Topics Punjab MCAT, Important Chemistry Topics Punjab MDCAT, Important English Topics Punjab MCAT, Important English Topics Punjab MDCAT, important mdcat topics, Important Physics Topics Punjab MDCAT, MCAT, MCAT English syllabus 2017, mcat format, mcat result, MDCAT, MDCAT 2017, MDCAT Biology, MDCAT Biology explained MCQs, MDCAT Biology MCQs, MDCAT Chemistry, MDCAT Chemistry explained MCQs, MDCAT Chemistry MCQs, MDCAT English explained MCQs, MDCAT English MCQs, MDCAT English syllabus, MDCAT entry test, MDCAT explained MCQs, mdcat format, mdcat mcqs, MDCAT Merit list, MDCAT New Syllabus, MDCAT online MCQS, MDCAT Physics, MDCAT Physics explained MCQs, MDCAT PhysicsMCQs, MDCAT registration, MDCAT registration date, MDCAT registration date 2017, MDCAT registration dates, mdcat result, mdcat score, MDCAT solved MCQs, MDCAT solved papers, MDCAT syllabus 2017, New Physics Syllabus for UHS MCAT, Past Papers UHS MCAT, Past Papers UHS MDCAT, Preparation of Document for UHS MCAT, punjab mcat, Punjab MCAT Biology MCQs, Punjab MCAT Chemistry MCQs, Punjab Mcat format, punjab mcat merit list, Punjab MDCAT Biology MCQs, Punjab MDCAT Chemistry MCQs, Punjab MDCAT English MCQs, Punjab MDCAT Physics MCQs, Sample UHS MCAT MCQs, UHS MDCAT, UHS MDCAT 2017, UHS MDCAT Aggregate Score, UHS MDCAT Biology MCQs, UHS MDCAT Dates, UHS MDCAT English MCQs, UHS MDCAT Entrance Test, UHS registration on July 7, 2017 by Pakprep.com Admin. 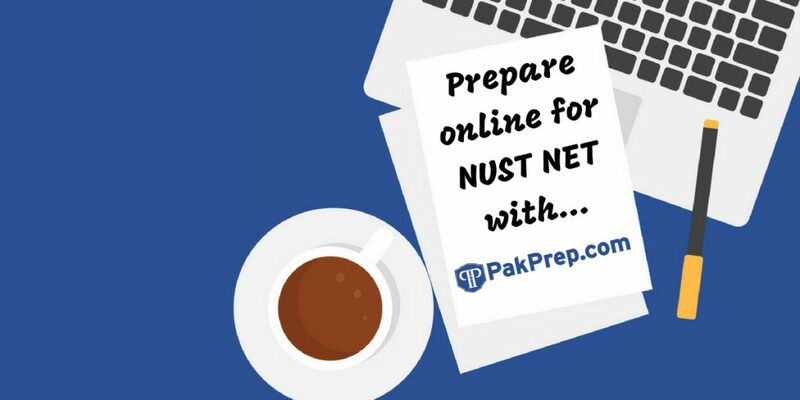 This entry was posted in MDCAT, Punjab UHS MCAT, UHS MCAT and tagged Best way to prepare for UHS MCAT, chemistry mcat, chemistry mdcat, Dental Entry Test UHS, download UHS MCAT Papers, download UHS MDCAT Papers, Download UHS Past Papers, How to Prepare for Punjab MCAT, How to Prepare for Punjab MDCAT, How to Prepare for UHS MCAT?, how to prepare mcat, how to prepare mdcat, How to prepare Punjab Mcat UHS, How to prepare PUNJAB UHS Mcat, Important Biology Topics Punjab MCAT, Important Biology Topics Punjab MDCAT, Important Chemistry Topics Punjab MCAT, Important Chemistry Topics Punjab MDCAT, Important Chemistry Topics UHS MCAT, Important English Topics Punjab MCAT, Important English Topics Punjab MDCAT, important mcat topics, important mdcat topics, Important Physics Topics Punjab MCAT, Important Physics Topics Punjab MDCAT, MCAT, MCAT English syllabus, MCAT English syllabus 2017, MCAT entry test, mcat format, mcat mcqs, MCAT Merit list, MCAT New Syllabus, mcat result, mcat score, MDCAT, MDCAT 2017, MDCAT Biology, MDCAT Biology explained MCQs, MDCAT Biology MCQs, MDCAT Chemistry, MDCAT Chemistry explained MCQs, MDCAT Chemistry MCQs, MDCAT English explained MCQs, MDCAT English MCQs, MDCAT English syllabus, MDCAT entry test, MDCAT explained MCQs, mdcat format, mdcat mcqs, MDCAT Merit list, MDCAT New Syllabus, MDCAT online MCQS, MDCAT Physics, MDCAT Physics explained MCQs, MDCAT PhysicsMCQs, mdcat result, mdcat score, MDCAT solved MCQs, MDCAT solved papers, MDCAT syllabus, MDCAT syllabus 2017, New Physics Syllabus for UHS MCAT, New UHS MCAT Syllabus, Past Papers UHS MCAT, Past Papers UHS MDCAT, Preparation of Document for UHS MCAT, Punjab MCAT Biology MCQs, Punjab MCAT Chemistry MCQs, Punjab MCAT English MCQs, Punjab MCAT Physics MCQs, Punjab MDCAT Biology MCQs, Punjab MDCAT Chemistry MCQs, Punjab MDCAT English MCQs, Punjab MDCAT Physics MCQs, Punjab Medical Admission UHS, Punjab UHS MCAT, Punjab UHS MCAT Syllabus, Punjab UHS Medical Test, Sample UHS MCAT MCQs, solved UHS MCAT MCQs, Solved UHS MCAT past papers, UHS, UHS Admission, UHS Admissions, UHS Biology MCQs, UHS Chemistry MCQs, UHS Chemistry New Syllabus, UHS English MCQs, UHS English Syllabus, UHS English Syllabus 2017, UHS Entry Test, UHS Fee, UHS MCAT, UHS MCAT 2013, UHS MCAT 2014, UHS MCAT 2015, UHS MCAT 2016, UHS MCAT 2017, UHS MCAT Aggregate Score, UHS MCAT Biology MCQs, UHS MCAT Dates, UHS MCAT English MCQs, UHS MCAT Entrance Test, UHS mcat merit list, UHS MDCAT, UHS MDCAT 2017, UHS MDCAT Aggregate Score, UHS MDCAT Biology MCQs, UHS MDCAT Dates, UHS MDCAT English MCQs, UHS MDCAT Entrance Test, UHS Merit list 2016, UHS Past Papers, UHS result, UHS result 2016, UHS Syllabus, UHS Test format, UHS test result on June 13, 2017 by Pakprep.com Admin. This entry was posted in Entry Test Preparation, Punjab UHS MCAT, UHS MCAT and tagged Best way to prepare for UHS MCAT, Changes in UHS MCAT Syllabus, download UHS MCAT Papers, Important Chemistry Topics UHS MCAT, MCAT entry test, MCAT test, New Physics Syllabus for UHS MCAT, New UHS MCAT Syllabus, Sample UHS MCAT MCQs, solved UHS MCAT MCQs, UHS, UHS Entry Test, UHS MCAT, UHS MCAT 2017, UHS MCAT Online MCQs, UHS MCAT Online Preparation, UHS MCAT Past Papers, UHS MCAT result, UHS MCAT Syllabus, UHS MCQs, UHS result, UHS Syllabus on May 13, 2017 by Pakprep.com Admin.